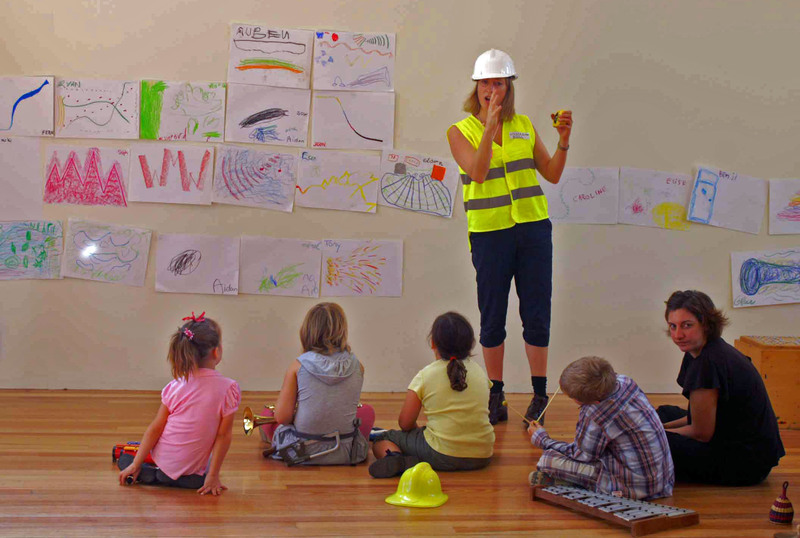 During the first week of the school holidays, I led the first workshops of my 2012 project series at ArtPlay. 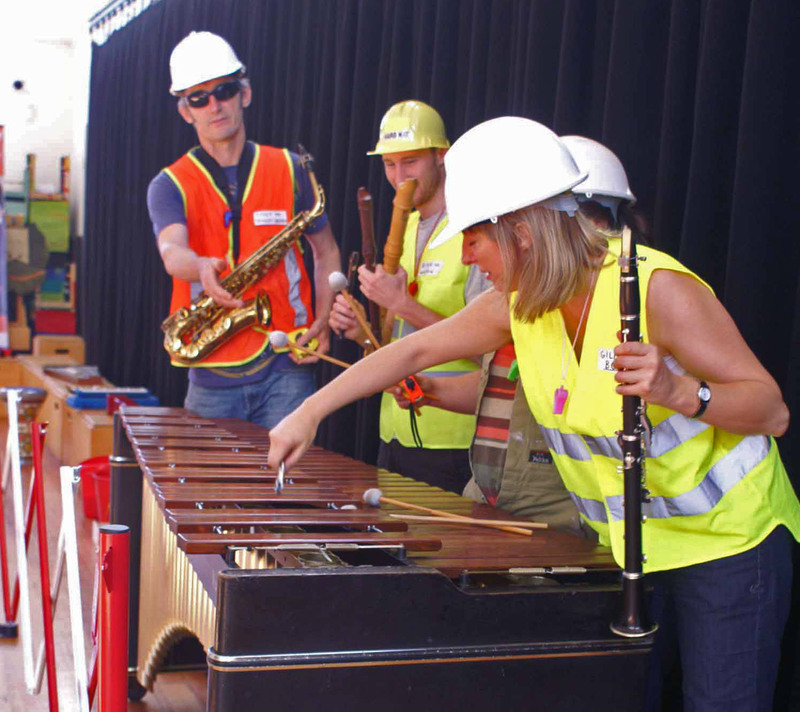 We set up the Music Construction Site – a busy place of work and activity where the tools of the trade were percussion instruments of all shapes and sizes (as well as any instruments the construction workers chose to bring along with them), and the construction took the form of a large graphic score, made up of images and symbols denoting the children’s sounds and musical inventions. 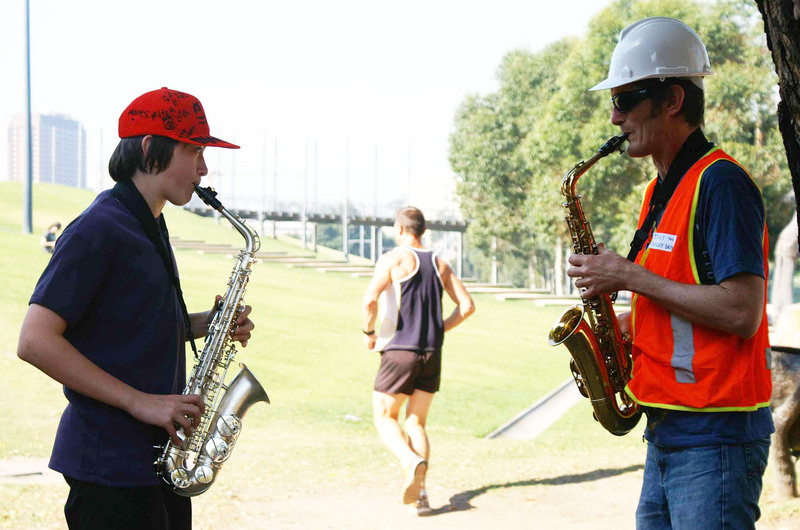 ArtPlay is situated in Birrarung Marr. If the weather is fine we can send some groups to work outside. At the end of the workshop, we put all the sounds in order and play through the score. 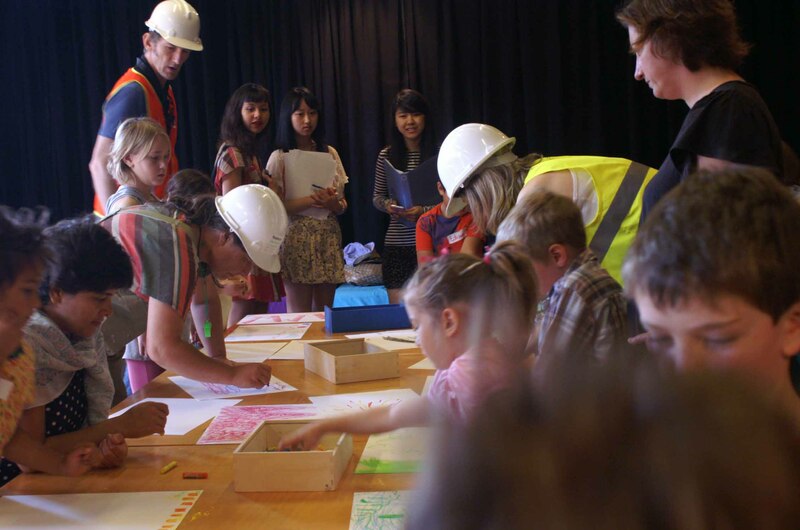 The next workshops at ArtPlay will be on Sunday 17th June. This time, we’ll be boarding the New Music Express – transforming stories into music! I’ve already written about the workshop at the convent I think – we had about 100 children gathered in the space who cheered as I entered (a big contrast to the silence and shyness that greeted Tony and I the first time round). We created the sounds of a rainstorm using body percussion, sung two African songs and one Timorese song, and created music to tell the story of Lake Ira-Lalaru, and the village submerged beneath it. We had a big jam on our verandah, introducing the ANAM students to all the children that Tony and I have been working with these last few weeks from our local area. We played Forever Young, as lots of the children now know the chord accompaniment on the chime bars (they learn from each other. One plays, and the others watch and memorise and wait for their turn). We also played with the new kakalo collection, all made at Saturday’s working bee. Maun Tony was still in Dili, taking his daughter’s to the airport. That evening, everyone ate at our place. We organised a song-writing workshop at the Esperanca Lorosa’e English class. Their teacher had gathered a group of students from across all of his classes. We started with a name song, each person singing their name in turn, then some rhythmic work with words, then invention of verses, choruses and melodies. A fantastic, catchy groove emerged. One student grabbed the opportunity to go to Iliomar for the day. Tony and I worked through the aftermath of being burgled. Sarah learned she had cerebral malaria. We performed live on community radio, an experience not without its initial challenges in setting up, but a huge experience for everyone involved and one that was incredibly affirming for our work here. This was the day of a full moon, and while it certainly exerted a strange and strained atmosphere over much of the day, we ended on a real high, and walked home bathed in its bright moonlight. The students had a day off and went to Tutuala, hosted by a group of UNPOL guys. Tony and I went to Esperanca Lorosa’e, this time to do a workshop for the kindergarten. There were probably 50 children there, plus lots of parents. Some of the local boys from our verandah jams came with us to the kinder, lending us a wheelbarrow for the instruments that we were bringing, and making a bit of an early-morning procession. “Where are you going?” many people called out to us. “To the kindergarten,” we called back. Smiles all round. At the kinder, we sang songs, did some movement and actions, created a body percussion rainstorm with the thunder-makers, and did some rhythmic ensemble music-making with everyone playing an instrument and learning to stop and start on cue. It is a wonderful kinder program I think. The teachers are very professional, and very gentle and warm in their work with the children. They told Kim that they loved the workshop we did – they’d never seen anything like it before and wished that they could do some professional development training with me. It’s a shame the program has been on summer holidays for most of my time here. Thursday afternoon the community again converged on our house, and this led to further Frisbee games on the front lawn. “It’s like a park,” said Sarah in wonder (emerged from her sick bed to watch the activities). One interesting thing that we observed was that, for the first time, the landlord’s two older children joined in with all the other children. Usually, when this crowd of noisy, boisterous boys with their dirty clothes and high energy levels come over to our house, these two children disappear back to their own house. But now they were joining in, with no apparent qualms. This was a shift. Games were followed by an impromptu Reading Club. Tony got out all the books that I’d bought at the Alola Foundation (probably the only books currently available for children in Tetun) and the children sat together on the verandah reading them together. We also had copies of the books that Victoria from Kidsown Publishing had made and sent over for us, and these passed around eagerly, with children touching the photos of the children they knew in the books and saying their names, as well as reading the text aloud to each other. On Friday we took the ANAM students to the nearby village of Cacavei. A friend we had made through the English classes, Tomas, lives in Cacavei and he offered to host our visit, and organise a group of children and a space for us to do a workshop. More than 100 children and adults gathered around the large mat we placed on the ground. We sang our old favourite, Mobakomeeenofway, to get things started, and then passed out the instruments and did some rhythmic work. We started in unison, but then divided the group into sections and set up some rhythmic grooves. Later we created words to go with a simple pentatonic melody I taught. “It’s a song about feeling happy,” I told them. Vaci ica rau rau kanta vaihoho [Today we’re feeling good singing together]. Sing together, then play together, sing together, play together. On cue from me. Ensemble. Fantastic. At the end of the workshop, Tony, Lina and Rachel all performed for the crowd. Me? I was knackered from leading! Happy to be in the audience! They each played solo then improvised together. They ended with the most beautiful improvised performance of the song we learned at the kindergarten, Ikan hotu nani iha bee [All the fish are swimming in the water]. It was simple and beautiful and in fact quite moving. Then Tomas took us walking in the nearby jungle, where we made our way through thick hanging vines, spiky leaves and branches, and soft piles of leaves and found the site of the ancient King of Cacavei’s castle. It sounds like a fairytale, doesn’t it? It was a natural fort site, part made of huge boulders already in place thanks to nature, and dry stone walls made by people. This was the day of the Toka Boot [The Big Play] and that deserves a whole separate post. One of the biggest jams I’ve ever led. One of the most fun. Today (Sunday) we are packing up the house, and working out who to give all the different things we’ve accumulated here, such as the set of kakalos. Tomorrow we go to Dili. Tuesday I am presenting part of the Professional Development session about community arts for local Ministry of Culture people and NGOs. Wednesay I hope to be able to make a visit back to the house I used to live in when I first arrived in Dili and do some music with the chidlren I met there, all those weeks ago. I know they missed me when I left. Then Thursday…. we leave. We have just had 2 days of ‘Loron Boot’ – (literally ‘big days’) that are holy days when most things are closed and everyone spends time at the cemetery and at church, honouring and remembering the dead of their family. Therefore, today has been my first day in Lospalos when I’ve been able to meet with government and NGO people who are relevant to my residency. Mana Er and I spent an active morning meeting up with these people today. We started at the Ministry of Education and Culture, where we had a very positive and productive conversation with the senior man there. I talked about the composing work that I do with children, and he asked lots of questions about numbers of participants, age groups, and so on. 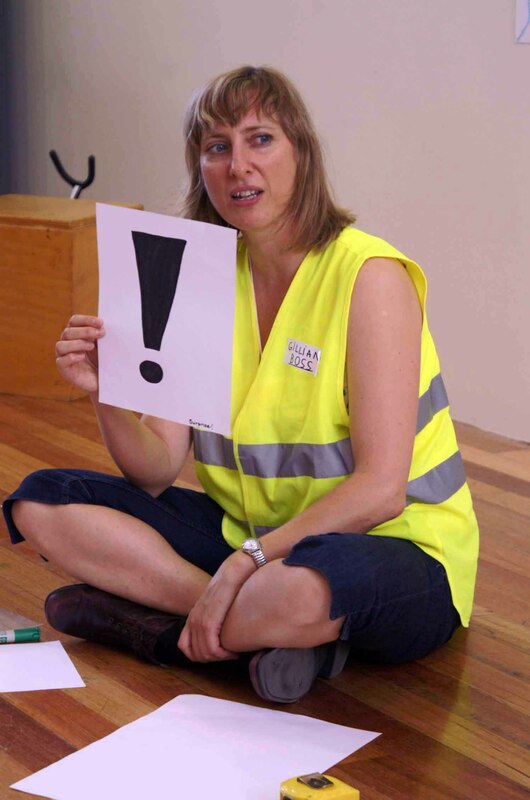 One of the things I have been concerned about is the practicality of making projects happen in the school holidays – essentially my time in Lospalos coincides exactly with school holidays! But today I learned that Sr Abilio was quite relieved that I wasn’t trying to do something in November or February, as those months were already choc-a-block full of activities. I told him about my idea for creating an event of some kind at the end of January, and seeing if we could invite people from Dili to travel to Lospalos in order to attend (and at the same time enjoy a weekend in this beautiful part of the country), and he was quite excited about this. For me, I was thrilled to learn that Sr Abilio runs a traditional music and dance ensemble. I explained that I was particularly interested in learning to play traditional instruments, and he seemed very open to me joining in with their rehearsals – they meet three afternoons a week. Thus I am starting to see a schedule of some kind present itself, where I can spend my mornings working with groups, on projects that run for up to five days in a row, and some afternoons with Sr Abilio’s group, and others on my own at home, developing work and ideas further. We met with two other local NGOs as well, and I am starting to see it could all get very busy, very quickly! At this stage though, I am only in Lospalos for a few more days. On Saturday I go back to Baucau, then on Sunday afternoon I am back in Dili. I am getting back a couple of days before my scheduled flight back to Melbourne as I am still to collect my visa extension and passport from the Immigration office – it seemed prudent to allow extra time to ensure that I get this well before heading to the airport! The Armidale project marked the end of a very busy few months of projects – between now and January 30th I have no more ‘special projects’ to lead. I still have my usual teaching load in schools, and I have some papers to mark for the university, and some minor additions to make to my Masters thesis before get the final binding done, but I don’t need to plan for any more big projects for a while now. Lots of plans to put in place for 2010, however – the year is looking very full already, which is incredibly gratifying. I’ve received some fabulous invitations to work with different organisations and people around the country. Writing papers and articles – I wrote three academic papers between October and November and submitted them for forthcoming conferences in 2010. I think I have a journal article left in me now – probably something a bit more substantial, around 5000 words perhaps. Not sure when I’ll write this – maybe when I get stuck into my thesis corrections. Leading a collaborative project between the MSO ArtPlay Graduate Ensemble and the Chordwainers, an ensemble of performers who play on the leather instruments of Garry Greenwood. A very successful, interesting project with a great musical outcome. Teaching the last classes for the year at Melbourne Uni – the Bachelor of Ed students and the MTeach students. Some very interesting sessions, and lots learned by all. Continuing my usual primary (elementary) school teaching load at Pelican Primary and the Melbourne English Language School for new arrivals (these are both pseudoynms). It has been a bit hard-going this term. The students are tired. I am tired. And the Pelicans in particular get incredibly unfocussed and distracted when they are tired. And there are a few tricky, subversive student elements at MELS that I find rather testing this term. But we are getting there… we will get there…! I also got to have a few days away with Tony at the Wangaratta Jazz Festival. He was playing (and played fabulously, as always)…. I sat in the shade, grooved along while drinking local wine, and chilled out, basically. The day after the festival we stayed in the area and went off to Mount Buffalo for a walk up to the Cathedral and Hump, where we perched awhile on a rock, before heading back down. So it has been a busy term (we are now up to Week 6 of an eleven-week term). I’m happy to be winding back a little bit now, in terms of inventing new projects and coming up with innovative and imaginative ideas. My brain is looking forward to a bit more open creative space. It’s been a long time since I posted – I’m sorry, dear readers, I have been thoroughly entrenched in thesis-land, writing up, then writing some more… I am making steady progress, but it is not finished yet. Not yet. I am still to set the date for the post-submission party. Meanwhile, work continues. It’s been busy. Back in the April school holidays, I had four great days at ArtPlay. 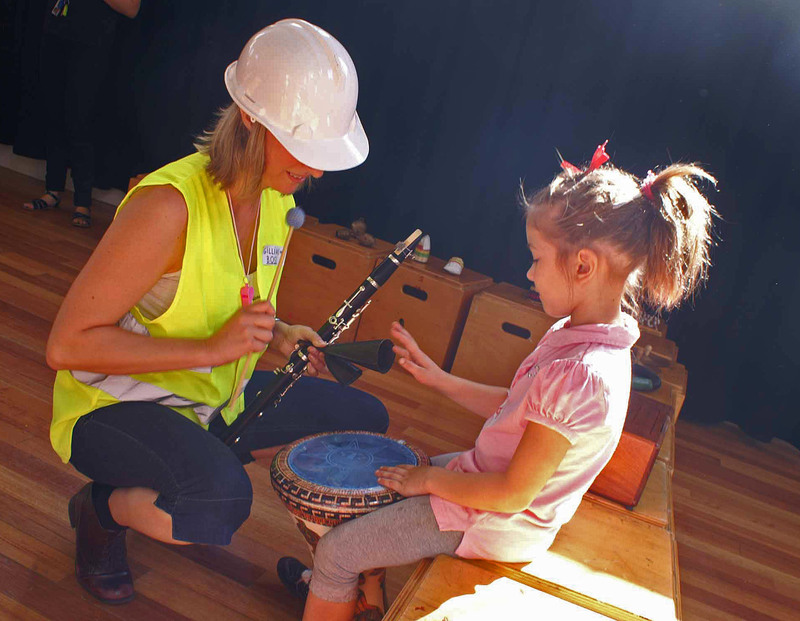 The first two were working with this year’s MSO ArtPlay Ensemble, and the second two were with a group of primary school students who were coming to music for the first time. That was with a program called City Beats. The MSO ArtPlay Ensemble composed music inspired by Rachmaninov’s Rhapsodie on a theme of Paganini. We looked at the idea of composing variations on a theme, likening variations to musical disguises. I was particularly happy with my warm-up sequence for this project, which introduced a number of composition techniques that Rach makes use of in the Rhapsodie, but which explored them in game form. 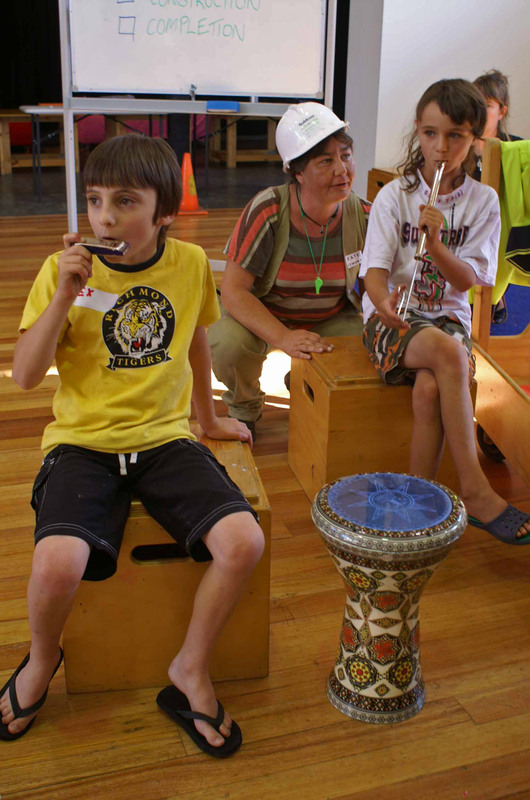 It was also interesting for me to observe my own role as the project leader, particularly on the first day, when the children spend a lot of time working with their adult musician (from the MSO) in break-out groups. (I’m paying particular attention to my role and pedagogy in this year’s project, as part of the large funded research project happening at ArtPlay). In the break-out groups, when I move from group to group, keeping an eye on how things are progressing, I was also able to spend time with individuals, sometimes because they needed a bit of extra support or direct encouragement, and sometimes because they needed challenging, and could be taken aside for a short time to develop solos or more demanding material of their own.